Back in 1998 I did my mandatory military service at the Södermanland Regiment[a] in Strängnäs. As all regiments it had its victory banners, and its most recent claim to fame was the Battle of Stäket[b]: where in 1719 and the twilight years of the Swedish Empire, about 800 soldiers of the regiment had soundly defeated a much larger Russian force and saved the capital from destruction at their hands. So the story went, anyway. In reality, there was very little known about the battle. It was described as "confusing", and the three reports from the Swedish commanders did not agree on what really happened. What everyone agrees upon was that the Södermanland Regiment had deployed against approximately 3000-4000 Russian soldiers that had landed near Stäket and fought a battle while darkness fell. The next day, the Russians had embarked on their ships and sailed away. Which would make the Swedes glorious victors, right? Right? It's not that simple. For starters, we didn't know what the Russian objectives were - nor did we really know what happened during that confused fighting. When I saw that a whole museum dedicated to the battle had been established I just had to go. Archaeologists had done a thorough examination of the battlefield and come up with a description of the battle that has solid support in the archaeological record. In short: While the Russians on the northern shore of Stäket were soundly defeated by sustained cannon fire from Swedish ships, the infantry battle on the southern shore ended with a Russian victory where the Södermanland Regiment ultimately could not hold out against a force that was between three and five times larger. Additionally, there is no evidence that the Russian had any plans on doing any damage to Stockholm - it was a quick hit-and-run raid, whose purpose was to do as much material damage as possible to the Swedish economy, not an invasion. Thus, while there certainly wasn't any dishonor on either side - and certainly sitting in a dark forest waiting for someone faceless to come and try to kill you like so many soldiers have done throughout the ages takes courage - the mythical glory of the Battle of Stäket was thoroughly wiped out. I think that's for the better, but some people have a harder time giving up on the mythical glory of the past than others. My guide explained that I wasn't the first person with a connection to the Södermanland Regiment that had come to the museum; and that some people, especially the older ones, had a hard time accepting the results of the research. The younger ones looked at the evidence and accepted it - the older couldn't: "Well, that's your version of history, we have ours" was the reply. There was no glorious Hollywood style Lord of the Rings-charge and victory, and I'm glad to see that teenage fantasy go on the junk heap. A desperate counterattack at night against a force many times larger than your own, in a long war that is all but lost, is grim and badass enough. A film about the battle, shown in 170 degrees cylindrical projection. See below for the movie, or watch it on YouTube[c]. A sabre that has belonged to Peter the Great[d], who gave it to Prince Croij au Eccaud. The prince was subsequently captured by Magnus Stenbock at the decisive Swedish victory at the Battle of Narva[e] and traded the sabre for being allowed to keep his life. The inscription reads "Als König Carl der Zwölfft und seine kleine Macht // Mit Gott der (Russen Heer) hatt in die Flucht gebracht" or, in English "When King Charles XII and his modest might // with God brought the Russian army to flight". Weapons belonging to the Swedish commander at the Battle of Stäket, Rutger Fuchs. Two flintlock pistols (15.2 mm), manufactured by master pistol smith Adam Anthon Gerhardt in Stockholm, 1739. One flintlock musket m/1716 (20.04 mm), probably made in Jönköping around 1716. One bayonet m/1716 (20.04 mm), probably made in Jönköping around 1716. One small sword of the type used by the Swedish army during the Great Northern War. Probably manufactured in Germany 1685. Russian documents, from the artillery museum in St Petersburg. This is the first time Swedish researchers have had access to descriptions of the battle written by the Russian side. 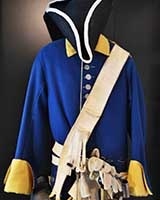 Swedish uniform, of the kind that was used by the Södermanland regiment. Swedish (left) and Russian (right) bullets. The Russian bullets still have a small tap sticking out, a leftover from the casting process when manufacturing them; while the Swedish bullets had it removed. This makes it possible to identify which side shot what bullet. Last page of the treaty that ended the Great Northern War.